Car sales dip last month | What Car? New car registrations have fallen for the 11th consecutive month, but the rate of decline has slowed to its lowest level according to the Society of Motor Manufacturers and Traders (SMMT). May's figures were down 1.7% on 2010 levels, with fleet and diesel orders both growing 10% to prop up the market. Just over 846,000 cars have been sold during the first five months of 2011 - 7.3% down on the same period last year - but the SMMT is holding its full-year sales forecast at 1.93 million vehicles. Private purchases fell by 15.3% in May and by 18.9% over the year-to-date. Diesel sales have risen by 10.7% and fleet demand is up by 11.1%. 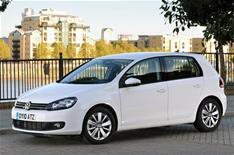 The VW Golf remains the top-selling diesel. Registrations of superminis posted their first rise in registrations since June 2010, with growth also seen in executive cars in May, possibly due to several new and face-lifted cars in these segments.